Acacia Media is a publishing project that releases resources that focus people on the greatest commands: to love God with all the heart and to love one another. Jesus said that all Scripture depends on these two commands, which means that we cannot truly understand the Bible until we read it through a lens of love. Scripture also says that the goal of our learning is love not profit. With this in mind, we want as many people as possible to encounter the love of God. All our media can be therefore be freely copied, downloaded and distributed. As a non-profit project, we are looking for volunteer proof-readers, editors and reviewers to help with our current media projects. If you have some time to help, please contact us. Currently, we publish the One with Christ series of devotional Bible Studies, as well as the Discover Jesus small-group studies. If you would like physical copies of our books or software, please contact us. We hope to have an online catalog available in the coming months. As part of our publishing project, we are working on software app that combines high-quality references tools with resources that focus people on expressing what they learn in love. To this end, Acacia Media has partnered with HELPS Ministries in the U.S and secured permission to include The Discovery Bible in our software. The Discovery Bible is not a new translation, but a unique system that allows any reader to easily access the rich original-language depths of the Bible. This is done by highlighting the original emphasis of the Greek and Hebrew and marking language features with an easy-to-learn symbol key. Our design also includes resources for small groups, discipleship, and personal devotions, as well as the ability for users to create and share their own content. With a clear focus on love, a unique method of accessing the depths of Scripture, and an inspired design, this software has the potential to bring a renaissance in Bible reading and spiritual growth to the Body of Christ. Ultimately, our goal is to combine this software with the freeslaves.org project and list enslaved families in a ‘love in action’ section within the software. This would allow users to make micro-payments towards a family’s redemption or give to another cause as they feel led. To build this software, we need to assemble a team of paid developers, designers, and testers, as well as a pool of volunteer researchers, writers, proof-readers, and editors. It is a significant project, requiring a significant investment, but it brings with it the promise of becoming a rich blessing to the Body of Christ. If you feel led to support this project, please contact us. The vision for Acacia Media is to release resources that focus people on the greatest commands: to love God with all the heart and to love one another. Jesus said that all Scripture depends on these two commands, which means that we cannot truly understand the Bible until we read it through a lens of love. Knowing this, a key part of our vision is developing mobile software that helps people to read and understand the Bible in this context of love. Our software design integrates resources that focus people on expressing what they learn in love. 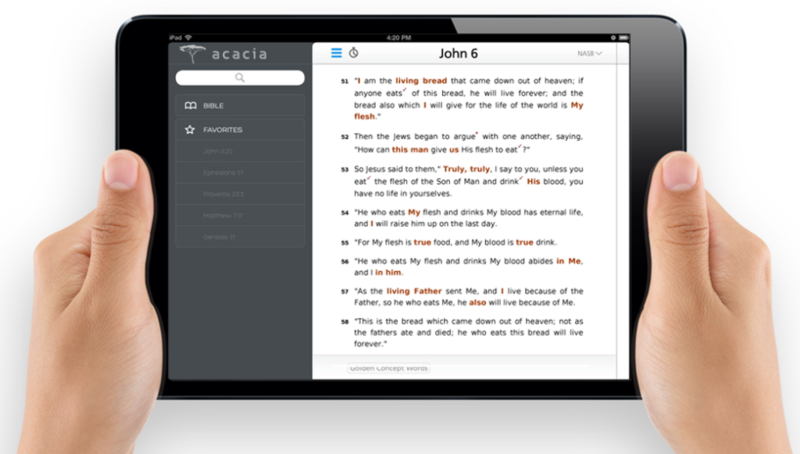 As Paul writes: “The goal of our teaching is love from a pure heart.” To this end, Acacia Media has partnered with HELPS Ministries in the U.S and secured permission to include The Discovery Bible in our software. The Discovery Bible is not a new translation, but a unique system that allows any reader to easily access the rich original-language depths of the Bible. This is done by highlighting the original emphasis of the Greek and Hebrew and marking language features with an easy-to-learn symbol key. Our design also includes resources for small groups, discipleship, and personal devotions, as well as the ability for users to create and share their own content. To build this software, we need to assemble a team of paid developers, designers, and testers, as well as a pool of volunteer researchers, writers, proof-readers, and editors. It is a significant project, requiring a significant investment, but it brings with it the promise of becoming a rich blessing to the Body of Christ. We would like to invite you to join with us in this project.